My post yesterday about Thomas Drake was hardly noticed compared to the list of NSA code names I threw out there. But Drake noticed. “You have any number of significant errors in your blog, including the fact that no charges by the government were reduced to misdemeanors,” Drake wrote me in an email. He invited me to meet with him and his attorney. I thought: What kind of person invites someone to meet with them and their attorney? And then I remembered: He’s from Washington! And more important, he’s now a whistleblower, and the maintenance of reputation and scrupulous adherence to the facts is part of the role. I invited Mr. Drake to correct the record, but haven’t yet heard back. In my former editor’s email, the word “documents” is repeated five times in case I don’t get it. But I went back and looked at my blog and I never used the word once. I said classified information, in fact because I know the difference. My point was and is that the government – the executive branch — decides. The criteria – information the release of which would do damage to the U.S. national security – is maddeningly vague. Hence the tug of war with the news media or whistleblowers when the government feels that its secrets have been compromised; in Washington at least, this is a deadly word game. I can only speak from experience: News organizations and journalists invariably claim (hide behind?) the argument that information that they want to publish is in the public domain, that is, that it is already compromised in some way. I’ve sat in many such a discussion and negotiation with government people to demonstrate that some piece or body of information was obtained using open sources. I’ve listened to editors (and others) argue that the information is “unclassified” and I’ve listened to and watch government people squirm in frustration, trying to explain that just because a piece of paper is stamped “unclassified” or has no markings doesn’t mean its release won’t do harm, that many pieces of paper or information put together makes for classified information – the so-called ‘mosaic’ theory – or that circumstances warrant the information not being published. I’ve listened to editors and security people and lawyers talk past each other for hours because the classification system isn’t perfect and because, well, we are talking about national security, a fairly grandiose and consequential concept. I’ve also been involved in discussions when classified information was involved, that is, information that the government has actual reason to believe is legitimately classified, and where the news organization can’t really argue that they obtained something already in the public domain. These are, shall we say, more complicated negotiations, and they are usually resolved by editors agreeing not to publish some detail or fact – even if it is already in the public domain – as a gesture. Editors like to call it something other than acceding to the government’s demands in order to maintain the balance of power. The government is invariably unhappy but content that the negotiation at least took place; that the publication in question plays its role and is inside the Washington vortex. If someone works for the government – or has a security clearance granted by the government – and breaks away from that vortex, takes independent action, the government retaliates. Whether it’s a former CIA director (John Deutch) accused by the security people of mishandling classified information or a standard issue whistleblower, the bureaucracy can be brutal, unforgiving, and duplicitous. The Wen Ho Lee case comes to mind. Government lawyers love to, need to, make examples of people, both to enforce the system of behavioral conformity and create legal precedent. I’ve dealt with many a whistleblower in the past and the patterns are pretty much the same: the whistleblower feels – feels – all of the inconsistencies and injustices, they want to tell their story. But at the same time, as former government employees, as vulnerable targets well aware not only that journalists will squeeze them dry and throw them away as quickly as the security types will pounce on any additional disclosure of ‘classified’ information, the whistleblower plays this little game of holding closely to their facts. In some cases, it’s all that they have. In Washington, in Washington culture, value is measured by information; that’s the power. Outside Washington, evil government is a better sell. If I wrote anything in my blog that is factually wrong, I’ll correct it. I see that what I wrote isn’t pleasing to Mr. Drake. I wish him the best. 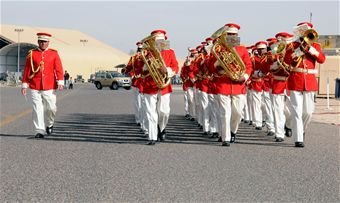 Kuwait has a secret military band!? I last wrote about the 332nd Air Expeditionary Wing and its classified location. But this little news clip from the Air Force even more demonstrates the inanity of official secrecy, as the 386th Air Expeditionary Wing, location classified, held an open house with the “host nation,” inviting families on the undisclosed location. Even the “host nation band” — that’s all the Air Force can say — played. Wikipedia and other web sources readily identify the 386th as being deployed at Ali al Salem airbase in Kuwait, which is where it is, even stated in its own official Packet. Has anyone seriously examined what the cost is to us (or to Kuwait) of having these bases that are known to all and our adversaries but are official secrets?